NotaryCam is a global e-notary service. It provides remote, video e-notarizations, third-party witnessing and e-closings. U.S. customers pay $25 for the service, and customers abroad pay an additional fee of $54. For about the last 15 years, the real estate industry has been waiting for the legalization of electronic commerce and e-notarization to make conducting closings with clients easier and more convenient. And when a small window of opportunity opened up three years ago, Rick Triola stuck his head through it. A former investment banker, real estate broker and escrow agent, Triola began to see the potential of the Internet to change how closings were conducted when the technology was still in its infancy. But legal friction over e-closings persisted for years, with the industry pushing for uniform standards and acceptance, and local and state governments insisting that all involved parties be physically present in front of a notary during all closings. Despite these challenges, Triola founded Settleware, a technology company that in 2004 completed one of the first e-notarizations. The process wasn’t perfect, Triola admitted. “Although exciting and innovative at the time, the process was clunky, requiring a physical, in-person meeting and additional hardware requirements, including a laptop, signing pad and an Internet connection,” he said. Then, in July 2012, Virginia became the first state to allow commissioned e-notaries to perform remote notarizations via a webcam — and Triola immediately saw the possibilities. Although only notaries licensed by the Commonwealth of Virginia are allowed to notarize documents online, Virginia explicitly gives its notaries the ability to notarize documents for people outside of Virginia. A screencap from NotaryCam’s service. By the end of 2012, Triola had founded NotaryCam, a global e-notary service that performs remote, video online e-notarizations, third-party witnessing and virtual e-closings. Using about 60 notaries certified in Virginia, NotaryCam conducts closings in all 50 states and has also performed e-notarizations in 60 countries to date. Once the notaries are certified by the state, they then pass a digital certification process and attend NotaryCam’s monthlong training “academy” before going live. Using the Google Chrome browser on a laptop, desktop computer or Android-based tablet with a webcam, clients connect to a virtual lobby and wait for their notary to appear. The notary verifies the clients’ identities by comparing the information they provide to a collection of more than 30 billion aggregated public records. “You must appear, and the notary must be able to look at you. We have taken identity protection to the highest level possible,” Triola said. When it comes time to perform the closing, NotaryCam can accommodate multiple signers from any combination of locations, and it can also schedule multiple signing sessions. Clients do not sign actual paper; instead, clients type their name onto the document during the session. 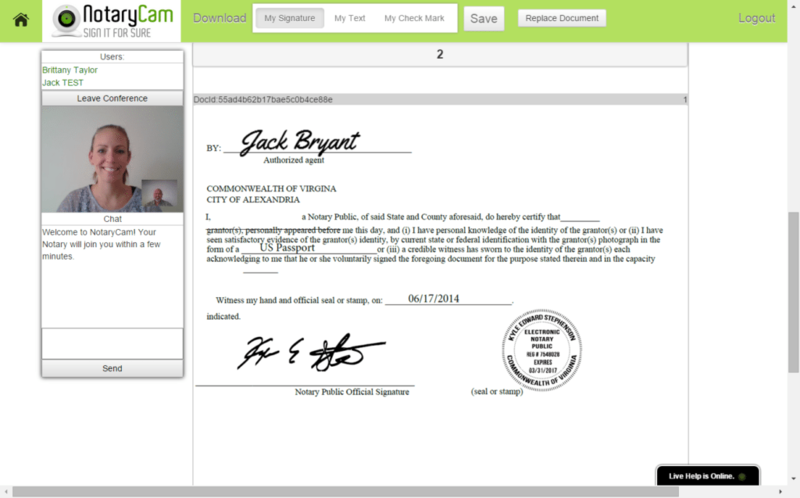 NotaryCam has embedded security features into the document to protect the validity of clients’ e-signatures. When the closing is complete, the notaries send out an email within minutes. U.S. customers pay $25 for the service, and customers abroad pay an additional fee of $54 — a savings of about 40 to 60 percent of traditional notary fees. NotaryCam was recognized by the National Association of Realtors’ REach program, which recognizes companies that are impacting the real estate industry with innovative technology. “This is a really exciting time for us, and regulators are finally getting on board,” Triola said. In fact, the Consumer Financial Protection Bureau is currently engaged in an e-closing pilot program to explore how the increased use of technology during the mortgage closing process could affect consumer understanding and engagement, and save time and money for consumers, lenders and other market participants. “We saw this as an opportunity to make life easier for agents, and in the process, move the industry forward to a paperless transaction,” Triola said. “Agents are entrepreneurs, and this offers a tremendous listing tool. In today’s busy, hectic world, sellers are looking for convenience.